"Forward Markets and Advertising Agencies"
The adoption of real-time bidding(RTB)–based forward markets is inevitable for both ad agencies and publishers to remain commercially viable. By applying RTB technology, forward markets can automate, integrate, and optimize the trade and delivery of display advertising inventory, which today is still mostly sold in traditional direct sales transactions. 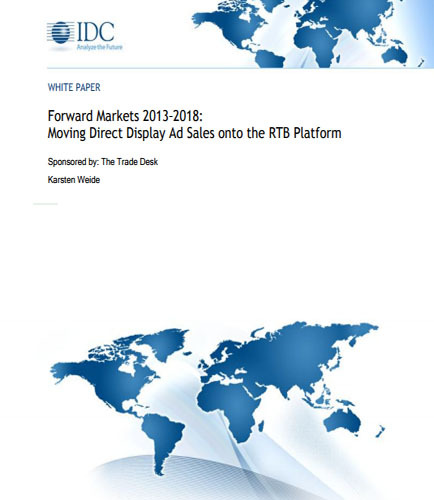 This whitepaper on “Forward Markets 2013–2018: Moving Direct Display Ad Sales onto the RTB Platform,” explores the in depth opportunities and challenges of a forward market built on programmatic infrastructure, with the same buyer-controlled audience targeting found in RTB today. Cloud ERP for manufacturing is now becoming an integral part of the business operations of the major manufacturing concerns. A survey was conducted to investigate cloud ERP goals and benchmark performance of cloud based ERP implementations in light of the changing operational landscape for manufacturers. Moving to a subscription licensing and cost model, the ability to access anywhere, anytime, and always up-to-date software makes cloud deployment very attractive to manufacturers today. Key Takeaways from this whitepaper on “Cloud ERP: Helping Manufacturers Keep up with the Times”: Discover how a cloud ERP deployment can keep pace with newer technology, which in turn can deliver more innovation See the value in better planning, collaboration, and visibility, which help produce more with fewer (physical) resources in cloud ERP for manufacturing Understand how cost savings can justify the cost of a transition to the cloud Read this white paper which looks at how cloud ERP solutions can aid innovation by providing better planning, collaboration and visibility to manufacturing companies to help them produce more with fewer physical resources. What is Digital Technology ?